Situated in Benfica, Rio's Municipal Market (known as CADEG) will serve exclusive codfish recipes until November 19th. A musical show and a Harley-Davidson motorcycles' exhibition are also included in the event. RIO DE JANEIRO, BRAZIL – This Friday, October 27th, Rio’s Municipal Market (CADEG), in Benfica, Zona Norte, opens the 5th edition of “Festival do Bacalhau”, the venue’s traditional Codfish Festival. Until November 19th, chefs from CADEG’s restaurants will be serving unreleased codfish based dishes, specially created to the event. From October 27th to November 19th, one can find the most diverse dishes made of codfish, key ingredient in the Portuguese-Brazilian cuisine, photo internet recreation. Due to the strong culinary influences from Portugal, codfish is a key ingredient in the Brazilian cuisine. In special occasions, like Christmas and New Year’s Eve, there is always a codfish based plate on a typical Brazilian family’s table. 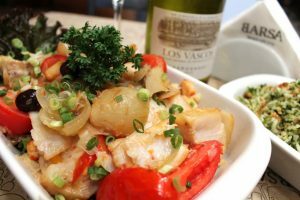 In Rio’s bars and restaurants, codfish is never put aside either: it is, for example, the very basis of “bolinho de bacalhau”, one of the most popular finger food among Cariocas. Around thirty food establishments in CADEG will be participating in the festival this year, including wine shops, Portuguese restaurants, among others. Most of them will be serving dishes and products in promotional prices. This Sunday, October 29th, visitors can take part at “Yin/Yang na Gastronomia: equilíbrio entre opostos” (Yin/Yang in the culinary: balance between opposites), a free culinary workshop with Chef Marcelo Barcellos. The class happens at 12PM and includes free food tasting. Next Sunday, November 5th, Chef Marcos Carvalho will lead another culinary masterclass, “Desmistificando o bacalhau: aprenda de forma fácil como preparar e impressionar” (Demystifying the codfish: learn how to prepare and impress). Also starting at 12PM, the class will focus on easy but delicious recipes that can be prepared by anyone. A wine workshop will also take place at the Festival, on November 12th, when oenologist Ana Paula Oliveira da Bodega Garzón will present the premium Uruguayan wines to the audience. The class includes free wine tasting and starts at 12PM. On the “Festival do Bacalhau” closing Sunday, November 19th, a Harley-Davidson motorcycles’ exhibition takes place at Rio’s Municipal Market. What’s more, band Jackstone will perform at 3PM, promising to involve the audience with its renditions of the Rolling Stones’ hits. Among the diverse codfish dishes exclusively prepared for this festival, one can find mouth-watering options like “Bacalhau à Lagareiro” (codfish with steam cooked vegetables in a herb butter sauce and rice with apricot and cashew nuts), at Mexido Gastrô restaurant; and “Bacalhau Mediterrâneo” (“gadus morhua” codfish braised with olive oil, garlic, olives, Portuguese onions, peppers, cherry tomatos, fresh herbs and prawns), at Barsa Restaurant. When: October 27th to November 19th – Mondays: 8AM to 3PM; Tuesdays to Saturdays: 7AM to 5PM; Sunday: 11AM to 4PM.